Luxurious Villa Baan Souha is a true asian designed gem located at Samui most beautiful area and provides its guests with hotel services within the space and privacy of its own lush tropical gardens. Our private deluxe villa is located minutes walk to Choeng Mon beach and a vast choice of restaurants as well as all needed amenities. Our large 3 bedrooms 4 bathrooms villa provides its guests with hotel services at Samui leading location. Complemented with fine hand crafted teak furniture & Thai ceramics, this has got to be one of the most magnificently appointed Private Villa's on the Island of Koh Samui. The layout of the complete Villa is designed to give you a feeling of freedom, space and tranquility. With 220sqm of interior area the villa is spacious and the terrace adds another 100sqm with a private infinity-edge plunge pool taking prime position on the outer rim of the terrace. This villa is ideal for larger families or families with teenage children. 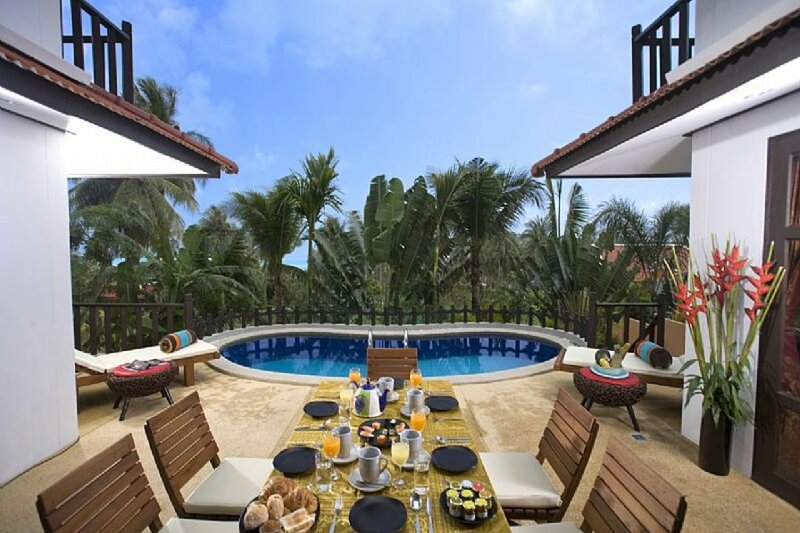 Our private Villa is a harmonious blend of Thai style with Asian flair. Thai roof architecture enables the property to blend with the surrounding environment and maximize the fresh sea breezes that float throughout the villa. Inside, the use of stylized carpentry in rich timbers contrasts nicely with a light colour scheme creating a chic décor.The 3 bedroom villa is on 2-storeys. First floor features a living room, gourmet kitchen, lobby area, guest WC, dining room, ensuite bedroom and a TV room. On the second floor there are two very large master bedrooms each with dressing room and fully marble bathroom with separate walking rainy shower and large bath tub. Local amenities in Choeng Mon offers a choice of over 20 restaurants, bars and vinotheques. 3 supermarkets within easy walking distance of villa as well as shops.